After 40 days at sea and even longer away from his family, just moments after setting foot on dry land, Skipper Stephan Fridell received just what every Dad would be longing for – a huge bear hug from his two children. 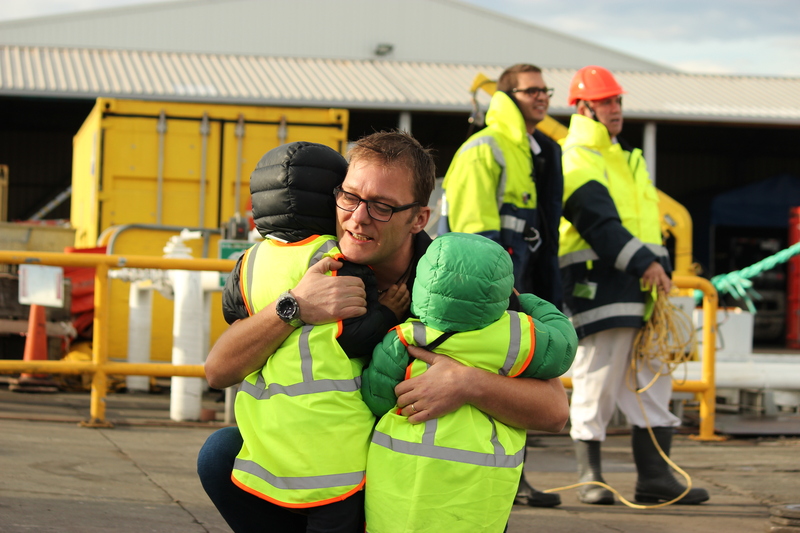 Stephen’s kids were amongst the crowd of Sealord staff, and family of crew who were waiting excitedly on Sealord wharf on Friday 15th June as Stephan expertly manoeuvred the eagerly awaited Tokatu into berth. It was the end of an epic journey for the crew of Tokatu as they brought the new vessel, the largest for the NZ-owned deepsea fleet, home to Nelson from her build in Norway. Stephan was joined by alternating skipper Rex Chapman for the voyage from Norway to Panama, then continued on to complete the full voyage down to Nelson. A large crowd gathered on Wakefield Quay to view the Tokatu as Stephan brought her in through ‘the Cut’ joined by Port Nelson’s Tugs, the Coastguard and the local Waka ama club. Welcome home, Stephan!